Escape on an active cycling break to Sweden and experience beautiful nature as you go off the beaten track and into the depth of Stockholm's surrounding countryside and archipelago. Cities and towns in this area are vibrant, offering a wealth of attractions and activities to suit all interests, while the countryside is vast with open meadows, deep forests, glittering lakes and extensive archipelagos - it really is a land of contrasts. The tour starts and finishes in Sweden's capital. Stockholm is a modern, bustling and historic city spread over 14 islands and one of the world's most beautiful cities with a combination of ancient history, colourful architecture, nature and city life. Take a stroll through Stockholm's old town Gamla Stan, with its narrow cobbled streets, welcoming shops and lively cafes. Visit Skansen, the open air museum with historical buildings, living history exhibition and Nordic Zoo. Nearby is the Vasa Museum, definitely not to be missed! The ship sank in 1628 on its maiden voyage and stayed preserved in the sea for over 300 years. Combine these with a visit to Ecopark, The Royal Palace, several museums and many shops, you won't want to leave. After a brief visit to Stockholm, this active cycling tour gives you a chance to escape everyday life and explore nature in one of Europe's best kept secrets with culture and traditions in abundance including charming villages, imposing castles and seasonal festivals to celebrate. 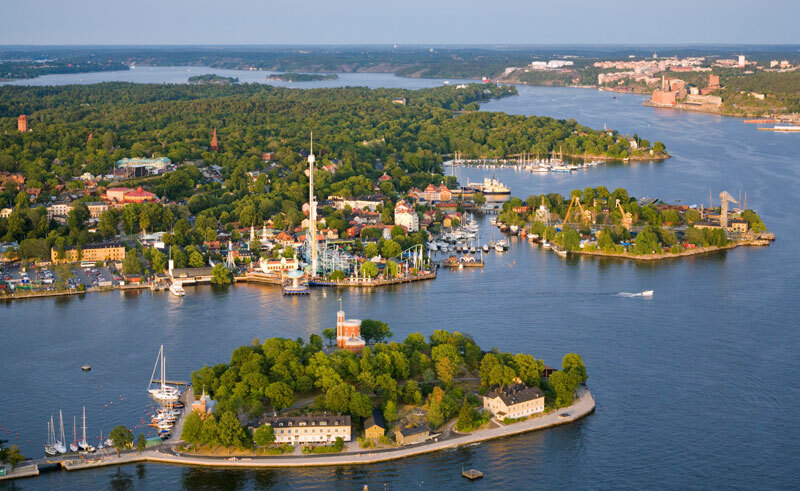 The archipelago stretches deep into the Baltic waters with an impressive 23,000 islands and skerries, making for a wonderful environment to explore and enjoy for all visitors. On a self-guided tour you will be given information on the schedule ahead but have flexibility to experience the adventure for yourself and at your own pace as you travel on the planned route to your destination. Although you control your own trip, you don't need to worry about the luggage as it is transferred each day between the different accommodations, along with the necessary equipment. One of the advantages of a cycling trip is you are able to travel at your ideal pace to both appreciate the surroundings up close and cover long distances at a time, allowing you to see many attractions along the way. The journey takes place on quiet country lanes or off road on good paths using mountain bikes with hybrid tyres. At times the terrain can be challenging so a certain degree of fitness is required to ensure a safe and enjoyable experience. Fly to Stockholm and make your way (payable locally) to the city centre hotel. You then have the remainder of the day to explore the city and its attractions. The information pack will be waiting for you with instructions on the tour ahead. In the morning you are transferred to Tyreso Palace where the trail begins. Take time to stroll around the English gardens of this imposing 17th century palace or to the nearby small islands with wonderful views. The cycle journey first takes you through Tyresta National Park, a protected area with forest lakes and a wealth of wildlife. After time in the park cycle to the idyllic village of Dalaro and explore the picturesque narrow streets with wooden houses, pay a visit to the 15th century church or take a swim from the white beaches. Continue on bike to your overnight accommodation a few kilometres away. Cycling distance today approximately 38 km. Cycle the short distance back to Dalaro and take the morning boat heading out amongst the many islands that make up the southern part of Stockholm's archipelago. The first stop is the pretty island of Orno and a chance to enjoy its unique nature, both woodland and open landscape, plus opportunities to swim from the smooth rocks as well as visit historical landmarks en route. After fresh archipelago air, sit back in the restaurant, enjoy the fresh local produce and admire the wonderful sea views before taking the evening boat to the island of Uto, your destination for today's overnight stay. Please note, low season dates don't have a meal included on Orno and is extra at the Uto accommodation. See below. Cycling distance today approximately 30km. Today you are free to explore this lovely island. Take the bikes and cycle the length of the island, cross a bridge to the smaller island of Alo where you find a white sandy beach and a charming fish restaurant. Uto also offers other activities such as sea kayaking and hiking to enjoy the fresh air and nature. You may decide to hop to the neighbouring island Nattaro with sandy beaches and great views. Cycling distance today approximately 25 km. In the morning you have a chance to visit the windmill built in 1791 and enjoy one of Uto's best views, or visit the mine museum to learn about the history of mining in this community. Afterwards catch the boat to another island, Fjardlang, located on the edge of Stockholm's bustling city. The whole island is a nature reserve with marked footpaths winding their way around the island with spectacular views from Tysta Klint, the island's highest point. Then prepare for your journey back to the city making your way to the hotel and your last night on the tour. The evening is free to enjoy Stockholm's nightlife. On your last day you may decide to use the bikes for the last time and take a self-guided cycle trip through the Ecopark before making your way back to the airport (payable locally) for your return flight home. Alternatively, you can extend your stay in Stockholm and sample the delights this wonderful city has to offer. Explore Sweden's southernmost wilderness area on this delightful hiking adventure.